The book itself is a 9″ by 9″ full-color, 224-page sofcover (ISBN 978-0-9817322-0-6), and is illustrated throughout with photos and reproductions of the author’s artwork. It’s sumptuous and shows a great attention to detail and thoroughness. It’s easily one of the better-looking self-published books I’ve seen and I was interested to put some questions about the book and it’s production to Jennifer. TheBookDesigner: Your book combines your writing, your paintings, and your ideas on how to reflect inner beauty in the way you approach the world around you. How did you come to combine these creative expressions in one place? Jennifer Robbin: The glimmers of the ideas that became Growing More Beautiful started a number of years ago. I’ve always written about the process of working with my image consulting clients, it helps me to stay engaged by finding deeper meaning in the often superficial world of fashion. Plus, my experiences as an artist and painter give me a unique perspective. About 8 years ago I created a beautiful website for my business Clothe Your Spirit that was a preview of what would eventually become my book, and I included a philosophy section that contained a couple of the essays that became the basis for the color and body image chapters in Growing More Beautiful. The ideas were so compelling to me that I just had to write about them. I hoped that the site would do it, I wouldn’t have to write a book. But the ideas grabbed hold and wouldn’t let go. Did you always want to be an author? Have you written a lot in the past? It is interesting that you ask if I wanted to be an “author” not a “writer.” Having written one book, I know it is a long and lonely process, one I never really wanted to go through again. I write all the time and always have, but I’m much more interested in communicating ideas than in the craft of writing. As any writer will tell you, the first few drafts are fun, the rest is hard work. I was well into the last draft of Growing More Beautiful and still denying I wanted to be a writer. I was just obsessed with the ideas and had to get them on paper. However, during the final edits, something changed for me. I stretched so far that I ended up on the other side that now I am proud to say that I am both a writer and an author. Bring it on, I’m ready for more. My writing is more focused, and I take it seriously. I have a readership out there that wants to hear from me. I am so in tune with my audience, I know they need me and truly benefit from my insights. You published your first book with a small press. Why did you decide to self-publish Growing More Beautiful? My first book, Clothe Your Spirit, was published by a small non-fiction specialty publisher. They were well financed, and put quite a bit of money into the book promotion. The late Carol Butterfield, a well known Bay Area publicist worked on the book, and I went on a 7 city tour. The book sold well for years. When I started looking for a publisher for Growing More Beautiful I didn’t think I would have much of a problem finding one. But early in the process I had a highly respected agent tell me that the only kind of fashion books being published were those by celebrity stylists with an existing media platform. It turned out he was right. I pitched my book proposal for over a year, but in the back of my mind I was open to the idea of self-publishing. I knew that even if I was able to interest a publisher in my concept that it would be a tough sell for them to go for the full color book I was envisioning. I spent another year pitching my book and learning all I could about self-publishing and with great trepidation finally decided to go ahead. I wanted so much to turn my manuscript into a book and get it into reader’s hands, to not have it languish in a desk drawer somewhere forever. I admit it, I was impatient. I’ll also admit that I had a definite idea of what Growing More Beautiful should be like and was not open to modifications. Impatient, stubborn, controlling, determined and passionate—the recipe for a self-publisher! It’s very expensive to produce a full-color book at the quality yours achieves. Did you have a budget before you started? I worked through the numbers for months, trying to figure out how I could even produce a full color book and make a profit. We had a budget, but it was more an estimated cost projection. We figured $35,000-$40,000 but it came out closer to $50,000. Once you commit to doing this, you have to allow for unexpected expenses. Even with all the research and advance financial planning there were many costs we couldn’t anticipate, but once you decide to move forward you have to see the project through. How did you arrange the printing, and was it nerve-wracking having your book printed half a world away? I consulted with publishing expert Cynthia Frank at Cypress House, and she sent me to Global Interprint. You can’t communicate directly with printers in Asia, you need a print broker to handle everything for you. My designer, Nancy Campana, had worked with Global in the past, and all the books they produced together were beautiful. I had total confidence in my team. Is your book profitable? I know you run a consulting business as well. Has the book created more business for you? I will have to sell a lot of copies to make back what I spent on producing Growing More Beautiful, probably go into additional printings. It is too early to tell if it will make a profit. We used up our promotional budget and are now funding continuing marketing efforts through book sales and what I earn as a consultant. I’ve seen an increase in my consulting business, but not as much as I expected due to the recession. Fashion and art are tough sell right now. I did have one great paid speaking engagement last year, and I expect that it will lead to more. You’ve won numerous awards for your book. Have these influenced your sales? What’s been the biggest boost for sales of the book? The best thing about the awards was the morale boost they gave me. They came at a time when everywhere I turned doors were slamming in my face. At that point I was working intensively with a marketing person on distribution and specialty sales and a publicist on media placements, and I was getting constant rejection from everyone including libraries. To win these competitive awards, and read the positive and glowing comments on the feedback forms, gave me a morale boost. It confirmed that I wasn’t the only one that thought Growing More Beautiful was a worthwhile book. It was fun to announce them, but I don’t think they boosted sales. The Midwest Book Review had greater credibility. What other marketing have you done for the book? Here are the steps I took over the eighteen months: While the book was at the printers I did the basics, sending advance copies to pre-pub reviewers and long lead magazines. At that time I also designed and launched the website. I did an internet and direct mail campaign to my client base. The site is part of my marketing plan, and I have a subscriber list. I put a lot of extras into my site, because I want to give visitors a reason to return. I knew that I was going to depend heavily on word of mouth based on reader’s enthusiasm, and I had to keep giving them a reason to remember the book. I write a column/blog that is informational and informative, and send out a regular newsletter. I used my connections in the fashion business to place my book in boutiques and galleries all over the Bay Area, but they didn’t really sell. I went after the specialty chain stores and catalog markets, also without much success. I had a highly regarded publicist for several months with little results. I’ve promoted my artwork in two gallery shows that feature my book. Last year I did quite a few bookstore and library appearances and had decent sales at each event but sales never took hold outside of the events. I love speaking though, and I’m really good at it. I’m creating a video from my last big event, and this year I’m going to focus on getting it out there on U-Tube and use it to pitch TV shows. What’s the biggest surprise you’ve had becoming a self-published author? The biggest surprise? Not everyone thinks the way I do when it comes to buying a book. I made too many decisions based on what I would do. I walk into a bookstore or boutique or gallery and pick up a book I like and buy it on the spot. Other people are more cautious and need to be sold. If I had known going into writing my book that this was how I would feel at the end of the first year after it was released I probably wouldn’t have done it, but at the same time I’m glad I did. The resulting personal and professional growth through doing this project has been priceless. I put my creative talents to work in ways I never imagined. I’m amazed at all I can do, and I’ve also found out what I’m not good at. I feel fulfilled and confident on a very deep level, but also humbled and grateful. It’s a good place to begin the next phase of my life. If you could pick three tips for authors thinking of publishing a book like yours, what would they be? Self-publishing means you are starting a new business. Getting a book into print and selling it requires creating all the departments a traditional publishing company has, including accounting, technical support, fulfillment, marketing, sales, etc. As the author you will still need to do all the appearances and constantly put yourself out there. It helped that I already had a business infrastructure in place. If you read through this and think “whew, that sounds like a lot” I can tell you that my account does not even begin to describe the staggering amount of work. It doesn’t matter how much enthusiasm and energy you have, running an entire publishing company is intense and consuming. You must get help, it is impossible to do this alone. I hired a lot of great professionals all the way through the project, and as a result I have a book I can be proud of. I had a first rate developmental editor, contributing photographer, book designer, copy and proof reader, web designer. My husband Jerry Freeman pitched in as much as he could but he works full time as a computer consultant. We worked nights and weekends for a solid two years after the manuscript was completed. He has been incredibly supportive and I couldn’t have done it without him. So make sure you have someone in your corner to help. You’ll need it. But also keep in mind that this is your project and no one owes you anything. One more thing I’ll add here: I consider my choice of publicist one of my few missteps. That’s a tough one. Consider the market. After over twenty years as a consultant I know my audience. I knew they would love this book and I was right. My book will be timely for many years to come and a break could happen at any time. We’ll see, stay tuned! Tell us what plans you have for the future. Any more Jennifer Robin titles on the horizon? In terms of future writing projects, at this point I’d rather have a regular column in an appropriate publication than get started on my next book. My strength as a writer is in quick, topical pieces, and I love to do them. I have my finger on the pulse of how women think and what they want to know about. But I think I’m even better live and in person. I think I should have my own reality show. Seriously! With me, you never know what’s next. Thanks to Jennifer for sharing her experiences, it’s really food for thought. If you’re interested in her work, you can find her consulting business at Clothe Your Spirit and more information about the book at Growing More Beautiful. And as always, I’m interested in your comments. Is there a really special book you’d like to publish? This is very rare and very honorable to interview one of the author of the famous book. I hope I can meet her soon. Thanks, Carole. Just really good, practical advice to “do your homework” before jumping into a project as complex as book publishing, and especially with a book that’s complicated to put together and expensive to print. Thanks for visiting. As always, Jennifer tells it like it is about the publishing of a book. Many people think it is “easy.” And it is not. I like the way she has put the numbers out there for all to see – as well as how honest she was about her feelings and disappointments. If all “want-to-be” authors would read this they would find a wealth of information before they jump in feet first. Jennifer’s book is beautiful, informative, and very practical all at the same time. I loved it and gave copies to family and friends. I wish her well on her future success — sometimes it just takes time and a lucky break. Jim, thanks for your comment, and for your outstanding design work. Sometimes it’s quite a challenge to get authors to understand that self-publishing doesn’t mean you do everything yourself. If you start off with a quality manuscript, the people you bring on board to help create and launch the book will have a huge influence on its fate. Great interview and very realistic insights into the self-publishing world. 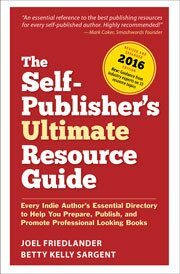 This is a gold mine of information for all who seek to self-publish and are looking for direction. of the team you hire to help you. As Jennifer points out, you really do get what you pay for. Jennifer, thanks for your comment, you make a good point. Certainly with your book there was no going halfway, because the book would not have had a chance. These books have a way of lasting a long time. You’ve had the chance to put your own ideas, in your own expression, out into the world and that’s no small thing. Betty, I think keeping control of the project was also important to Jennifer. But yes, books that are expensive to produce represent more of a gamble and require a lot more upfront investment on the publisher’s part. I’m not sure that the production cost for a publisher to take on the book would be very different from Jennifer’s. Hi Joel, Jennifer here. I want to add a comment about production costs. If you consider how much time you spend writing your book and how much time you will spend marketing it, you are doing a disservice to the success of your project to not do a professional job with the design and printing. This also means no errors! Poor production will disqualify you from all distribution and any chance you have to be taken seriously. Of course you don’t have to do a full color book like I did. I’m an artist and my goal was to create a book that was as beautiful to look at as it was inspiring to read. I highly recommend my editorial and production team, and contact information for all of them appears appears in the back of my book. You know, around the time I decided to do this (pre-recession) many of my friends were spending about the same amount of money remodeling their kitchens and bathrooms. They were sure they would make the money back when they sold their home. Oops. Yeah, I see why she had to do it herself. She’d have to be Beyonce to get a major publisher to take on the project, right? Jennifer Robin invested a lot of money in this project. But it was a labor of love. I wonder what a comparable book would cost a major publisher. The money trail in your business is so interesting. Betty, I think in this case you would never know that the book was self-published. It’s nicely designed and printed by the same printers who do hundreds of books for American publishers. I wanted to show some pages exactly for this reason, so you could see how well it came out. Most self-publishers would not take on a project this extensive, and I think from the interview you can see why. It’s great that you included photos so that we could see what the book is like. Thanks, Joel! Just curious about something…I was interested in your description of this book as one of the “better-looking self-published books” that you’ve seen. How does it stack up to any beauty book that you’d see on a B&N or Borders shelf? Sorry that I’m so ignorant — but can a typical consumer like me tell when a really nice book is self-published?